The Ukrainian Navy’s contingent of military dolphins has been under Russian jurisdiction (along with the military base in Sevastopol) since Moscow’s takeover of Crimea in March. Deeply dissatisfied with the situation, Ukraine is now demanding that the animals be returned. The Henichesk district of Ukraine’s Kherson Region, which opened a dolphinarium on June 21, is asking for the return of Ukrainian military dolphins from Crimea, where they remain despite the peninsula’s change in status, according to First Deputy Head of the Henichesk Regional State Administration, Dmitry Yunusov. “The military dolphins need to be returned to our country in the same way that Russia returned Ukraine’s seized military equipment,” Yunusov said. According to this official, the new dolphinarium is equipped to meet all modern specifications. The volume of the pool is 2,400 cubic meters and will provide dolphins with very comfortable and civilized living conditions. The dolphins are currently being kept in the public aquarium in Sevastopol’s Kozacha (Cossack) Bay. The aquarium was previously owned by the Ukrainian Defense Ministry, and before that it was administered by the Soviet Union. The cetaceans serve a civil function: A unique therapy program was developed using dolphins at the aquarium. These marine mammals were put to use to treat children and adults with various neurological disorders. In March 2014, it was reported that the animals would now serve the Russian Navy. 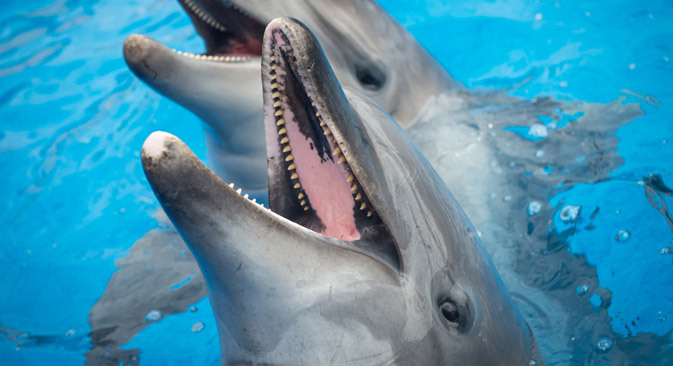 According to information from aquarium staff, in March of this year Russia confirmed its intention to purchase new equipment that will make the dolphins’ work more effective. “Money has not been allocated to maintain the animals in the recent past. There is only enough to feed them. The equipment that the dolphins work with is from the 1990s,” a spokesperson for the aquarium said. The employees are now hoping for government funding, which they lacked when the aquarium was under Ukrainian jurisdiction. In April of this year, the aquarium had only one sea lion and one family of dolphins. According to information from Vladimir Shcherbakov, an independent expert on naval armaments, at the time of the dissolution of the USSR, more than 150 bottlenose dolphins and beluga whales and almost 50 sea lions served in special Navy units. In 1995, after the collapse of the Soviet Union, the dolphins in Sevastopol came under the control of Ukraine. In 2000, the remaining 27 animals and special equipment were sold to Iran.